There is no exact date for the commencement of the trifurcation of the people of earth: the process was slow and progressive. The starting point is defined as the year in which the civilisations of the planet finally united around capitalism and liberal democracy under the aegis of the United Nations and its wordy World Constitution. For some this became known as the year in which history ended – though their evangelical cynicism was unfounded. There is of course a clear date at which the trifurcation was complete: this is the year in which the disembodied finally cut themselves adrift from the disintegrating society inhabiting the surface of the earth and accepted no more transfers to their world. This is known as the year of Separation. 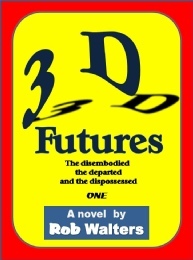 The departed were well into their journey to the stars by this time and so the three Ds were clearly defined, these being: the disembodied (Disems), the departed (Depars) and the dispossessed (Dispos). Separation was considered a far more important marker in history than the birth of a once popular religious martyr and so the year of Separation became, particularly for the disembodied, the year zero. On this measure, the World Constitution was adopted in 139 BS. Wispy clouds in a blue sky. Drifting aimlessly I, Zimbaud, watched one of my clouds; I became the cloud. I varied the blueness of the blue, the contrast between white and blue. I became the swirl of the cloud. Gelen joined me. I knew that she was here among my thoughts, touching the tendrils of a cloud, nudging them into a slightly different formation, just saying hello in the way that only she can. Testing the atmosphere of my space, she edged back towards her own segment until I answered her with a welcoming wave of pleasure. I love my cloud world. It began ages ago with a collector lying on his back in PreD earth staring up at a summer sky. But that was simply the start. I have woven that original data into a thing of infinite beauty, something that I will only share with Gelen. The collector is long dead, or maybe he earned enough credits to disembody—I do not know. In any event, the cloud world is now mine. I spend a lot of time luxuriating within it. Gelen thinks I spend too much time there, but what is too much time? When there is no end to time, no end to my existence in Cworld, time has no meaning. The only danger is ennui and I feel no onset of ennui, not in my cloud world, not in any of my worlds. Well before the World Constitution of 139 BS, the technological and cultural routes to disembodiment were taking form. The so-called Internet with its slow and physically massive servers and their arcane software had started to bring people together in ways which were previously quite impossible. It had already become a major factor in social interaction undermining the need for physical interaction and creating new social groupings. It also undermined political nationalism, though governments tried hard to resist this attack on their power bases. Understanding of the human brain had increased enormously through the use of scanning combined with experimentation. Virtuality progressed in two separate directions: one through research into virtual reality technology and the other through the progressive richness of computer games. The continuing horror of terrorist attacks and the subjugation of what were known as rogue nations led to ghastly injuries to soldiers. In earlier years, they would have died or continued life as near-helpless paraplegics, but new technologies provided them with new limbs and new lives: the clear distinction between man and machine began to blur. The advances were predominantly technological rather than scientific. In this era, interest and investment in fundamental science began to wane as the cost of large experiments rose in inverse proportion to the number of people who could understand their results. There was also a growing perception that science was not providing any practical answers to the planet’s social, environmental and energy problems. Thus, investment shifted into the development and improvement of known technologies which lead to a significant decline in academic research. One exception to this trend was in space flight. Here a frantic race developed between the East and the West in the search for a technique that could release mankind from the shackles of earthly existence in order to seek other habitable worlds beyond the solar system. This search was partly fuelled by the immense pressure of continued population growth, and partly in preparation for a time when life on earth should become untenable for some other reason. Project yourself into a future where the rich and accomplished have left their mortal bodies to inhabit a new world in which they are immune to all illnesses and to ageing. Imagine those left behind in a collapsed society ruled by people who quickly devolve into cruel savagery. Travel to the remote stars in search of a new earth where the colonists are still ruled by the mores of the old one.